Using the Salesforce Power-Up, you can attach leads, contacts, opportunities, and cases to cards in Trello. For now, our Salesforce Power-Up only works with the the Salesforce Enterprise, Unlimited, Developer, and Performance tiers (Editions with API access) This integration is only one-way—information from Salesforce will be published in Trello, but not the other way around. To enable the Salesforce Power-Up, find it in the Power-Ups menu and click "Enable". Once a lead, contact, opportunity, or case is attached to a card, their details will be pulled into the card back. 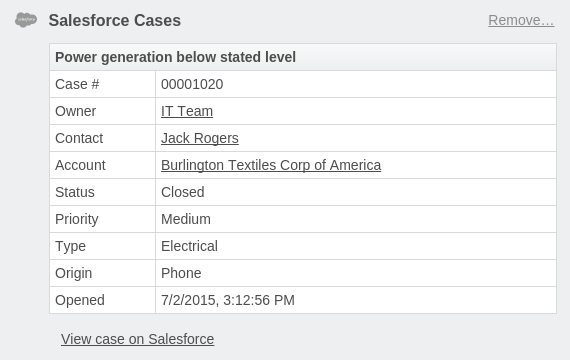 This will let your project manager or sales team check information without needing to access Salesforce. Currently, custom attributes will not show up on the card back. To disable the authorization with your Salesforce account, open the Power-Ups menu on the right side of the board. Then, click the gear icon and select "Remove Personal Settings". From there, select the option to clear data. You can disable the Power-Up for the board by opening the Power-Ups menu, clicking on the gear next to Salesforce, and selecting the Disable button. Disabling the Power-Up will not cause any data loss. It will change the formatting of the links in the card to be the same as any other attached links.